I've seen it all, tried what I thought was smart, and researched extensively for products to help clients with the utmost in beauty performance with speed and savings. From across the country clients constantly request these products so now I'm making them available for you. Most people want to look good all day with one quick application in the AM and a touchup mid-day - especially if you're involved in the media, sales, business, make presentations, engage in political interviews or interact with the public in any way and where a photo or video may be taken and last forever on the web - yikes. Well wring your hands and nash your teeth no further. With correct techniques applied in the morning and a 1 minute touch up at lunch or 2 minutes before din dins (where you may want to intensify your look), the products on this page are all you need to look your best and fresh all day - and nighttime too. With the streamlined, each product does double duty approach, you only carry 2 items totalling less than 9 oz. and measuring approximately 3"W x 4"L x 2"D (or the size of a couple of Smart phones) - now that's compact, streamlined and oh so easy. Smooth and easy to apply - this Gel Liner is water resistant and wears all day. Great for the underside of the upper lash line or on the lid for more dramatic looks. Its a great base for the smokey eye look - just add shadow over top. For a thicker lash look without the look of liner, apply in between lashes with a zig zag motion. Lots of uses - a must have. 7 piece Brush Set is streamlined, easy, convenient and travel size for purse, desk, gym bag or glove compartment (not while driving please). 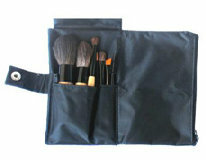 Bonus - zippered pocket holds your dual foundation, gel liner, lipsticks or other cosmetics - like you'd need more - NOT. This takes streamlined to a whole new level. 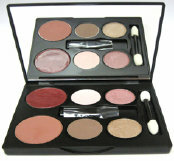 4 eyeshadows, 1 shader, 1 blush ALL in one mirrored compact. How excellent is that? These triple milled, highly pigmented colours are customized for optiminum performance and will take you from the grocer to the gala or boardroom to the ballroom easily. This item is excellent value both in price and practicality. Its the most efficient and effective use of product multi-tasking I've found - and I've personally test driven each colour - several times on all skin types and colours. This is fantastic sheer to full coverage for the combination or oilier skin type. Oil free and water resistant for great wear too. Applied with a brush, or sponge you'll get that HD looking finish your aiming for. Its been my personal fave for years - I can always count on its performance and it has 15% SPF, but won't interfere with photographs or TV lights. Customized for Cool, Warm or Medium to Dark skinned beauties. "I absolutely LOVE the dual powder. I NEVER believed a 3 in 1 could work as well as yours does. Thanks for saving me 3-4 min. in the morning (and that's a lot when you have little ones to get ready too)". This fantastic long wearing lip paint can be found in drug stores, Walmart, Target, etc. My personal faves are #785-berry, #772-wine, #795-brown/berry/red, #745-red, #787-coral, #750 pink highlight. 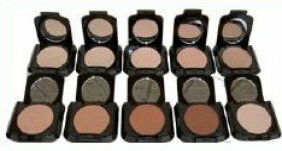 They mix wonderfully for a customized look and come with a balm conveniently placed at the end. Couldn't be easier. I'm sourcing the best places to buy, but currently Chinatown carries them in packs of 3. Be sure they are sharp enough. Or, try the electric model by Remington, which I also use and is found in most drug stores. "Thank you for your products! They definitely make a huge difference without needing much." Strip, demi or cluster, faux lashes are thee best va va va voom factor you can have in your streamlined arsenal. These babies are natural looking, yet oh so effective. Currently purchase by cheque or money order (including shipping). Product mailed via Canada or Express Post. NO SHOPPING!!! Simple. Just email your request. Need a little help or reminder on how to apply your makeup the Fast & Easy way? This Tip Card tucks neatly in with your makeup so its always there for you - and its FREE with your purchase. PDF Tip Card - Just download, print, fold and store with your mini pallet. Easy schmeezy.